If you're a mechanically inclined fellow, you don't own one screwdriver. You own a bunch. Different handles, different lengths, different sized tips, interchangeable bits, some for wood screws, some for metal screws, some with plastic handles and some with wooden handles. You have a few that are your favorites, the ones you always seem to grab first when you reach into the tool drawer full of your different screwdrivers. Every crankbait is a different tool in your toolbox. Some run tight. Some run wide. Some plow deep. Some skim the surface. Some offer flash. Some mimic forage. Some are loud and some are silent. And just like the screwdrivers, you have your favorites that you always seem to reach for. We think there is another one you're going to add to your box. Strike King has a proven stable of productive bass fishing lures. They released new crappie baits at ICAST that are already proving to be good quality producers for panfish. But back on the bass side, their new KVD HC Square Bill Silent 1.5 and 2.5 crankbaits have been hotly anticipated by the crankbait crazies like us. We picked up some of the new baits recently and took them to the lake to test first hand. First thing we noticed is the baits have good quality hooks, very durable lips and good split rings. No skimping on components that we can tell. 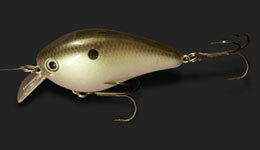 Several good colors are available but we tested Black Back Chartreuse and Green Gizzard Shad. The 1.5 is a diminutive bait, but its wide-body profile gives it more mass to cast a country mile. The 2.5 size can really launch, but the real story is in the wobble. The lure moves quickly down for a short-billed bait, but it really throws its head and tail from side to side on a medium-fast retrieve. The bait has no rattles, so it's really quiet coming through the strike zone but has a lot of action to announce its presence. It's one of those baits that we feel could slide into the strike zone quickly and then really trigger fish because of the wide erratic wobble. The KVD 2.5 comes through wood well. We fished it both parallel on laydowns as well as perpendicular across the bigger brush tops. It bounced and backed off branches really well, and with a high rod tip, the bait would crawl its way through the obstacles. Something about its square face really made it contact stumps and almost jump over them. Anglers will really feel when the bait contacts cover like that and be able to pause and react without getting hung as bad. Stump jumping is a hot fall technique as well as in the prespawn. But this wide wobble will come into play later in the summer, when fish roam the flats chasing bait. It's quiet and wild all at the same time. We like the the weight of the 2.5 for shooting the bait into close quarters with a shorter rod like a 6 or 6-1/2 foot medium baitcaster. When you want to make multiple presentations to a laydown, you need to be able to get in and out of the cover with multiple casts quickly and more importantly accurately. The weight of this bait makes it ideal for doing that. It's the same principal as flipping a jig. A 1/4-ounce jig is a lot harder to flip than a 1/2-ounce jig. With a high rod tip and slow crank, we were able to get the bait to wake a bit and could see some good applicatoins for it over grass that hasn't matted all the way to the surface. The last thing is the price. When a crankbait is $5, you can feel comfortable about picking up a few to play with. The shallow crankbait bite has small but frequent windows. So I always like to have plenty of colors and sizes to work the fish in those small windows. We picked up several of the baits. 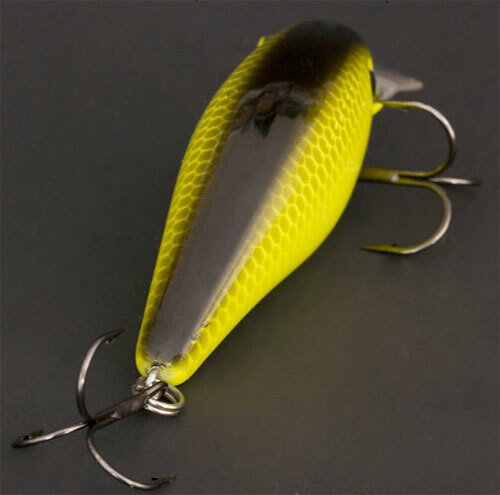 We really like the classic black back with chartreuse sides for dirty water and the Green Gizzard shad for clear water.